Only in my dreams could I have tea with the Queen, Princess Diana, Liz Taylor, Marilyn and Barbra! Today I am talking about roses often named for royalty and other past and present A-list celebrities. Roses, one of the oldest flora species, have been growing for centuries. Early varieties were simple by today’s standards but, I’m sure exquisite just the same. With so many varieties and colours, it is impossible to pick a favourite. I see the perfect Ecuadorian roses at the florist’s and think they are the finest and then quickly change my mind as I wander through my own rose garden and smell the most intoxicating fragrance of the “David Austin” roses. Then the “hybrid tea” roses quickly jump out to show me their perfection and beauty. It is believed that Empress Josephine was the first to grow a single flower garden. Her choice, roses. When she was first married to Napoleon I, she bought the Chateau de Malmaison located just outside of Paris. That became her home after her divorce and from then on, she with the help of English gardeners grew a magnificent garden with over 200 varieties of roses. She desired to have one of every known rose at that time from France, England, Germany, Asia etc. This was only made possible by the French military/ navy who aided in the delivery of these roses across borders even though wars should have prohibited it. Over the past couple of centuries, many new varieties of roses have been developed from those grown in her garden. The “Souvenir de la Malmaison” (left) was named in her honour 30 years after her death. I have chosen these particular gardens because of the variety of roses that are grown on their grounds. The Butchart Gardens have signs beside each rose with the name and country of origin making it helpful when looking for your favourites in your own area. The front of Monet’s home has many large, fragrant roses. While walking through the garden you may have the opportunity to talk to the gardeners who are constantly deadheading and caring for this amazing display. I was given one of these cut roses and pressed it in a travel book as a special memory of the day. Every time I’m in Paris I love to walk through the “Sculpture” garden at the Rodin Museum. There is a small formal rose garden (many are standards) around “The Thinker”. This, too, is a beautifully manicured garden. Paris has so many flower shops… it seems around every corner, with flowers spilling out in buckets onto the sidewalks in tempting displays. Like the neighbourhood patisserie or the boulangerie, each one of these floral boutiques is supported by the locals who live nearby. Wouldn’t it be wonderful if we had these little gems sprinkled throughout our own communities so that we too could be tempted to stop by on our way home for a lovely bouquet to perk up our homes? On the days when that’s not possible, Diptyque has the perfect substitute. The scent of a “Roses” candle burning drifts throughout every room tricking you into believing that your home is bursting with roses. 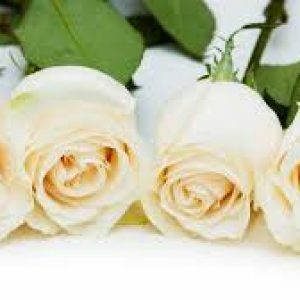 Roses, considered the flower of love and passion are given on the most significant occasions. It’s no wonder that many brides choose roses for their bouquets or gentlemen to send their lover’s fragrant posies for Valentine’s Day or special anniversaries. Imagine receiving this bundle of roses from such a handsome messenger! Empress Josephine and I have a few things in common. We share the same birthdate. Therefore, we were both born under the zodiac sign, “Cancer”. Our flower is the rose. I, too have planted a rose garden…not on the grand scale of that at Malmaison, but every spring I find space for a few new varieties. I prefer the hybrid tea roses with masses of fragrant petals. Luckily, I have had great success even though I live in zone 4. My rose garden is tucked in behind a tall brick wall surrounded by mature trees creating its own microclimate favourable for pushing the growing zone boundaries. The recent rains have encouraged many new buds and I’m sure my roses will bloom well into October. I have planted a yellow rose, “Midas Touch“, in a sentimental place in memory of my late dad. As if on cue, this rose often has its first bloom right around Father’s Day! Also as a part of my assortment, I have a “Princess Diana” and a “Marilyn Monroe” rose to mirror the personalities of two of my beloved dogs, Maggie and Lucie. As I tend to these roses it gives me great pleasure to be able to say “hello” to these special beings who are no longer here. Next spring I hope to find a “Souvenir de la Malmaison” rose for my garden as a reminder of a woman determined to grow beauty in spite of many obstacles. I once grew a rose, called Beauty, in the same spot in our garden where we took out a small diseased tree. After we cut the tree down, we banked twigs and leaves and sort of burned out the roots, which provided a lot of ashes. We mixed in the ashes with new soil and planted the rose. We had no idea that roses like ashes (perhaps they don’t! ), but that rose was the size of a baby’s head and exquisitely fragrant. It gave many blooms that summer, but I didn’t know how to keep it going. I loved the photos you posted, especially the Souvenir de la Malmaison. I don’t think I’ve ever seen such beauty! So very beautiful, I have to go to Paris!